Here at microBEnet we have been trying to help build up the field of “microbiology of the built environment.” Understandably, a lot of the focus of this field has been on human built environments and humans in such built environments. I (and clearly many others) believe that we can learn a lot by expanding this to include, for example, animals in the built environment (e.g., zoos, aquaria, animal shelters, farms, research facilities, etc) and plants in the built environment (e.g., greenhouses). Research in such non humans in the built environment is certainly expanding. Of course, humans are not the only organisms that create a built environment. Thus another area that I believe is important for many reasons is in built environments that are built not by humans but by other organisms. And some animals create elaborate built environments for which this microbiomes are both likely important and also can serve as a useful comparison to human built environments. Source: The microbiome of the ant-built home: the microbial communities of a tropical arboreal ant and its nest – Lucas – 2017 – Ecosphere – Wiley Online Library by Jane Lucas, Brian Bill, Bradley Stevenson and Michael Kaspari. Definitely worth a look and I think it would be great to see more and more studies of the microbiomes of built environments that were built by organisms other than humans. Microbial life is ubiquitous, yet we are just beginning to understand how microbial communities are assembled. We test whether relationships between ant microbiomes and their environments resemble patterns identified in the human home microbiome. We examine the microbial communities and chemical composition of ants, their waste, their nest, and the surrounding soil. We predicted that the microbiome of the canopy ant, Azteca trigona, like that of humans, represents a distinct, relatively invariant, community compared to the soil community. Because Azteca build aboveground nests constructed from ant exudates mixed with chewed plant fibers, we predicted that nest-associated microorganisms should reflect their ants, not the surrounding environment. The ant microbiome was distinct from the soil, but contrary to initial predictions, ant microbiomes varied dramatically across colonies. This variation was largely driven by the relative abundance of Lactobacillus, a genus frequently associated with hymenopteran diets. Despite the origin of nests and their means of construction, nest-associated microorganisms were most similar to the surrounding soil. 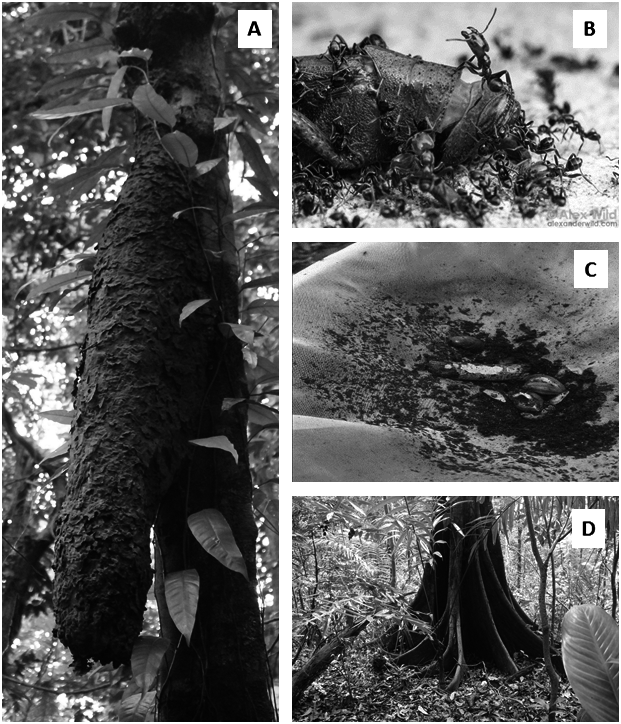 The microbiota of Azteca ants is thus distinct, but dimorphic across colonies, for reasons likely due to inter-colony differences in diet; microbiotas of the nests however mirror the surrounding soil community, similar to patterns of human home microbiota. The authors make a convincing case that it is important and interesting to compare microbiomes of built environments for such environments built by humans vs. those built by other organisms. And they have a nice introduction discussing this. Microbes are present in nearly every location on earth. Numerous studies are beginning to identify some of the rules by which microbial communities are assembled and vary geographically (such as the role of pH in microbial distribution [Fierer and Jackson 2006] or the high geographic endemism in fungal communities [Grantham et al. 2015, Barberán et al. 2015b]). Many of these studies have focused on the interactions humans and their microbiomes have with their “built environments” (hospitals, office buildings, and homes; Kembel et al. 2012, Hewitt et al. 2012, Barberán et al. 2015a). These have provided insight into how the geography of abiotic factors, like climate and physical structure, dictates which microbes colonize the home’s exterior (Kembel et al. 2012, Barberán et al. 2015b, Matulich et al. 2015). Likewise, features of the home’s occupants—their number, gender, and species, along with their associated microbiomes, can influence the home’s internal microbial community (Täubel et al. 2009, Lax et al. 2014, Barberán et al. 2015b). Our study highlights another organism known for constructing elaborate dwellings: the ant. Like humans, ant colonies build structures to live in, produce waste, and interact in ways that produce distinct microbiomes (Wheeler 1910, Hölldobler and Wilson 1990, 2009). We propose that like studies of the microbiome of the human home, ants and their built structures are intimately connected and capable of influencing one another’s microbial assemblage. The microbiota associated with social organisms are of particular interest as their colonial lifestyle provides a high risk of disease spread (Wilson 1975). To maintain colony health, many social organisms rely on associations with mutualistic microbes (Currie et al. 1999, 2006, Koch and Schmid-Hempel 2011, Kellner et al. 2015). Microbiota can aid in nest mate recognition (Richard et al. 2007, Theis et al. 2013, Dosmann et al. 2016) or provide protection through production of antimicrobial compounds (Promnuan et al. 2009, Sen et al. 2009, Barke et al. 2010, Visser et al. 2012, Madden et al. 2013). Because of these relationships, the microbiota of social organisms and their built structures are being explored as potential sources for novel antibiotic compounds (Pelaez 2006, Bode 2009, Poulsen et al. 2011), though detailed investigations of these environments are lacking (Madden et al. 2013, Kellner et al. 2015). The Neotropical ant, Azteca trigona, forms high-density populations in Panama’s seasonal forests (1–5 nests every 40 m) with colonies inhabited by >200,000 ants (Adams 1994, Clay et al. 2013). Azteca trigona societies build and maintain large papery carton nests (0.5–4 m in length) by chewing, regurgitating, and gluing together plant fibers (Fig. 1). This process creates ample opportunity for the ant microbiome to inoculate the building material. These colonies may live up to 30 years (M. Kaspari, personal observation), providing generous time for nests to develop distinctive microbiomes. Fueled on a diet of sugary honeydew and insects (Longino 2007), A. trigona are aggressive ants, with territories spanning multiple tree crowns and a consistent work force inhabiting, patrolling, and defending the nest’s exterior. Each colony produces up to 10 g of organic refuse a day, depositing it on the ground directly below the nest. This refuse mainly consists of ant waste, as well as occasional parts of carrion and nest material. The constant refuse input generates a long-term interaction between canopy and forest floor microbial communities (Clay et al. 2013). Our study uses Azteca trigona societies to pose similar questions pursued by studies of the microbiome of human societies: How do the microbiomes of individual colonies differ from the waste they produce, and to what extent do the bacterial communities shape the microbial communities of the nests they inhabit? We ask do the gut-origins of the exudates used in nest construction and maintenance make nest microbiotas an extension of the ant colony, or do they maintain microbiomes more similar to the surrounding environment? We further test the prediction, driven by assumption that core microbiota are maintained by ants (Hu et al. 2014), that inter-colony variation in the composition of the ant microbiome and refuse community will be smaller than, yet correlated with, the variation found in the nest and soil. Finally, because microbes are often metabolic and biogeochemical specialists, we explore how the chemical composition varies among the ants, their refuse, nest, and soil. Through these questions, we aim to shed light on how the microbiome of a species interacts with and is shaped by the surrounding environment. Figure 1. Photos of (A) Azteca trigona nest, (B) ant, (C) refuse in collection bucket, and (D) environmental landscape. Photos A, C, and D were taken by Jane Lucas. Photo B was taken by Shannon Hartman (www.antweb.org).